Here’s a quick VBA macro for removing axis gridlines and greying out all the lines in an Excel plot. Graphs are supposed to communicate data in a meaningful way. That’s the whole point. But too often people miss the opportunity to create graphs that effectively communicate the story they want to tell in a way that’s both easily readable and aesthetically pleasing. In this time of decreasing attention spans, quickly and effectively telling the story of your data has never been more important. So let’s take an example narrative and look at how we can create a better graph to get our message across. 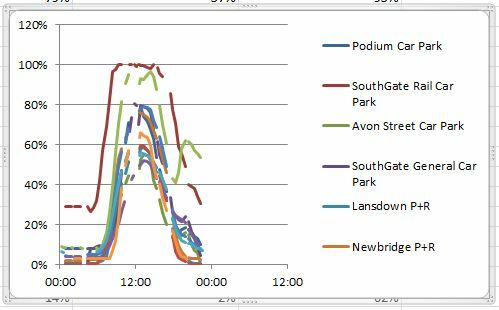 I’ve got some nice data about the usage of Bristol car parks we can use as an example. I have a hunch that Cabot Circus car park (very large capacity and primarily used by shoppers) has a lot of spare capacity that could be better used during weekdays so here’s my message. Cabot Circus car park is underutilised in the week and they should offer reduced rates to office workers Monday to Friday to monetise that spare capacity. A pretty messy plot. We can find Cabot Circus’s data in there but we have to work for it.